Yesterday was one of my favorite days at Assets School. What makes it even more special is that it doesn’t come around every year. Because we have multi-age homerooms, our curriculum is presented in cycles, as opposed to repeating each year. 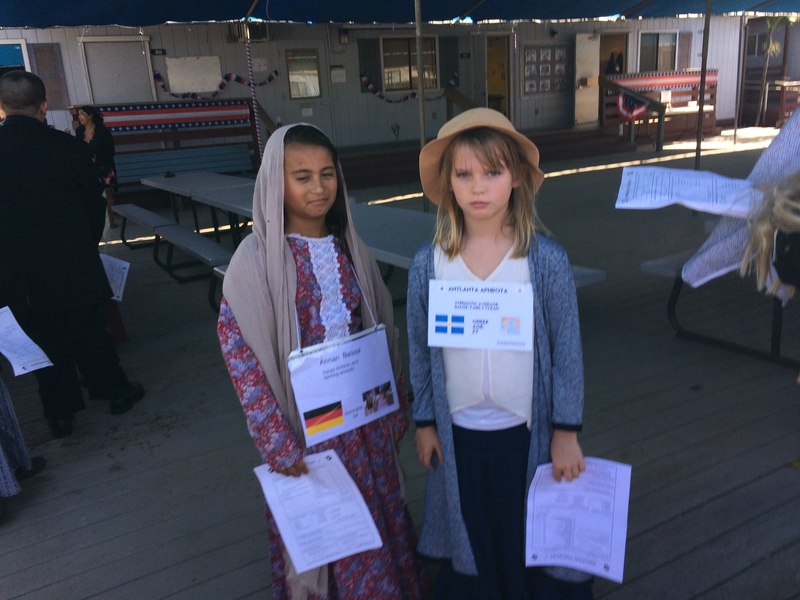 Yesterday was the day our 5th/6th graders participated in the immigration simulation! One of the reasons I love this activity is because it reflects so many core features of the Assets program at one time. It’s experiential, integrated thematically across various disciplines, and focuses on students becoming better informed, active democratic citizens. 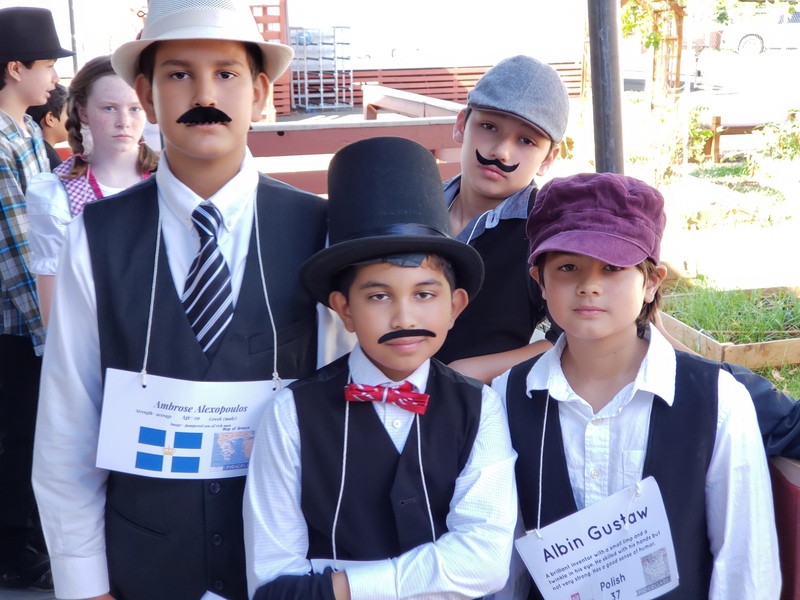 The time period is set to the turn of the 20th century and each student is assigned an immigrant character. 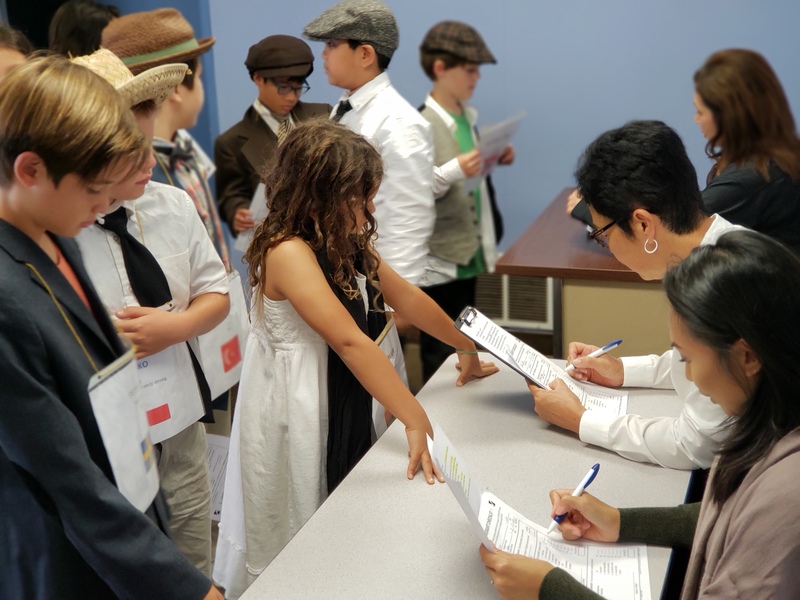 Dressed in character as Western, Eastern, Southern European and occasional Asian immigrants, students stand in line to enter the Ellis Island processing station. It is hot, the line moves slowly and students get uncomfortable. Once in the processing center, students rotate through various stations, where faculty and parents play clearance officials and doctors, quizzing students on their names, marital status, education level, vocation, country of origin, and intent in America. When they enter the Character station, they are asked if they’ve ever been to jail, divorced, or exiled. Their political and religious affiliations could be dangerous answers. How much money they have can be advantageous, or the lack thereof could be seen as suspicious. When they reach the Health station, the students’ sight and hearing are checked. Students suspected of having conditions like typhoid, whooping cough or diphtheria are quarantined and possibly denied entry. Some students gain entrance to America, where they become citizens and proceed to take the Oath of Allegiance. These new citizens write postcards back to their families, celebrating their good news and then pursue their American Dream (in our case, working on puzzles were popular). Other students are denied entry, often for medical reasons, and deported. They also write letters home. There is an Appeals station where students can attempt to persuade the officials. It is often a precarious moment, as students have waited a long time and been through many stations, to now have their fate decided. The Immigration Simulation is a great example of how our curriculum is integrated. There are multiple grade 5/6 homerooms and each prepared for the simulation differently but each took a traditional social studies topic and explored it via multiple means. Students read about immigration and immigrant stories in language arts and social studies. They learned about push and pull factors, and the immigrant experience. Some students wrote letters in advance, seeking sponsors already in America. In math, students graphed immigration levels during different years and from different countries. Students worked with Ms. Shannon in Drama to further develop their character, beyond the demographic information they were provided. Some students crafted elaborate backstories. At least one student represented his own great-grandfather, and did family research. The students’ work in Art will reflect this time period and themes as the year moves forward. Today, students continue their studies by focusing on Hawaii and its major waves of immigration. 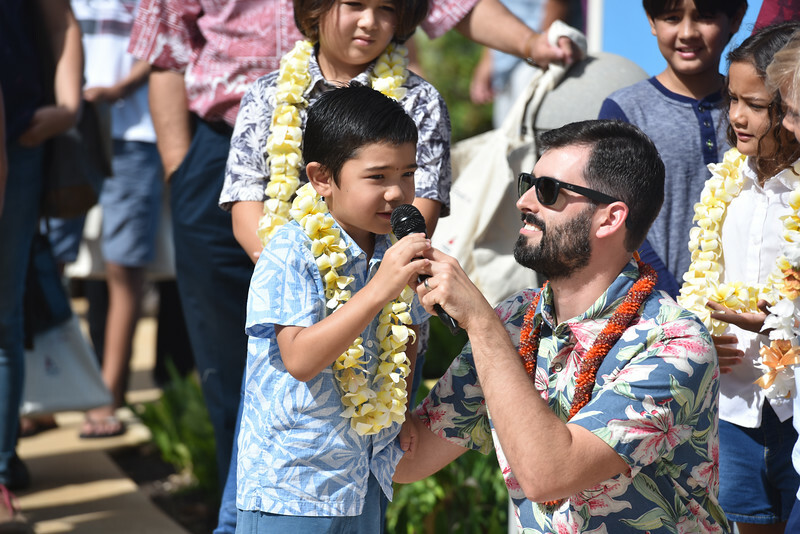 Different classes have focused on different ethnic groups who have settled in Hawaii. Today, students will share history and an activity that they’ve learned about from their ethnicity of study. All students will gather for lunch, where they will share food from their studies. Ms. Katie, our music teacher, has been working with students to perform traditional songs from these countries. Again, the core subjects are integrated with the arts so that students have a deeper learning experience. Next week, the students will visit the Hawaii’s Plantation Village, where they continue their experiential learning. Of course, our students are not simply learning about immigration in the early 1900s. Many of the themes and debates regarding immigration are as relevant today as they were then. Who is allowed to immigrate? How many people are allowed? How does immigration affect jobs and the economy? What are the fears surrounding immigrants? As I watch our students explore and experience learning in this way, I’m reminded of something W.E.B. Du Bois wrote in 1903, at about the same time in history our simulation is to take place. In, “The Souls of Black Folk,” Du Bois describes schools needing to be, more than ever, a place for training, “the broader, deeper, higher culture of gifted minds and pure hearts.” He writes about the journey to seek freedom, “the freedom of life and limb, the freedom to work and think, the freedom to love and aspire.” Which brings him to the three goals of democratic education – the capacity to take part in “work, culture, and liberty.” Work, Culture and Liberty. That’s what I see when I look at our students participating in this immigration unit. Du Bois finished his thought on work, culture and liberty by declaring, “all these we need, not singly but together, not successively but together, each growing and aiding each, and all striving toward that vaster ideal…the ideal of human brotherhood.” Indeed. We do this work as educators with hope and belief that our students will be the ones who move our country closer to its grand ideals. I love the whole concept of Assets!! Both of my grandchildren are attending this year. Can’t wait to visit from the mainland again and hopefully be there for grandparents day. Thank you for giving them a positive and unique learning experience.